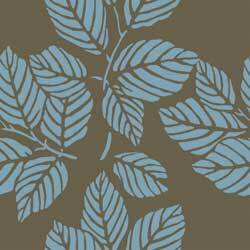 I am now the proud owner of this wallpaper from ferm LIVING. I read about some crazy discounts they were offering on their closeout designs and couldn't resist buying this pattern. I got it in the mail today and could not be happier with it. The colors are perfect for my house. This photo probably doesn't do it justice. So, here is my dilemma. What wall do I put it on? 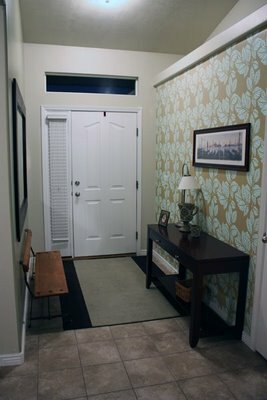 I bought it with my entry way in mind, but my dining room wall would work nicely too. 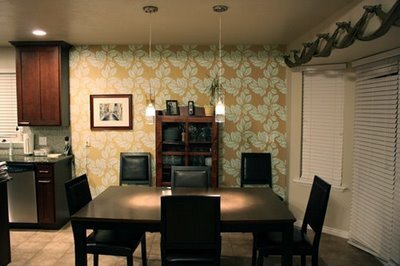 I originally planned to paint a mural (simple pattern or leaf motif) on my dining room wall, but now I'm worried about it competing. Anyway, I used my mad Photoshop skills to do a quick and dirty mockup of what it might look like on both walls. Readers, please help me decide! I only have enough for one wall.